This Summer Pasta Salad is my re-take on Caesar Salad with bow-tie pasta and a creamy Caesar dressing! 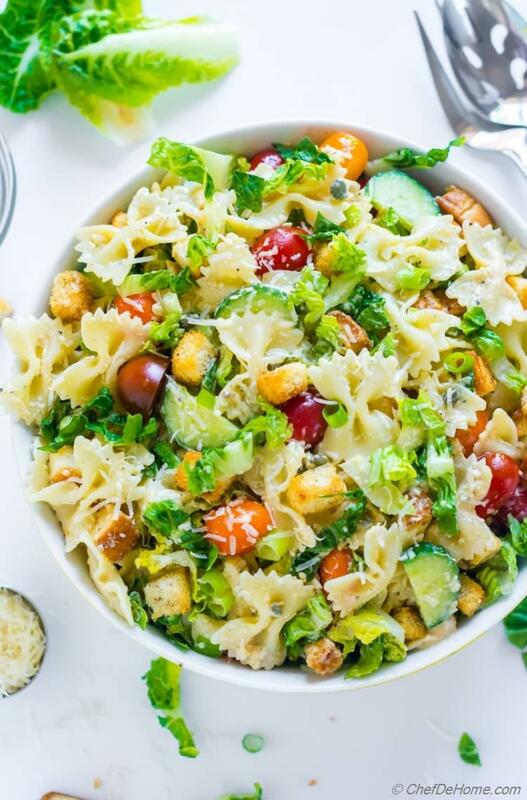 Caesar Pasta Salad, a creamy summer pasta salad inspired from Caesar Salad with crunchy romaine lettuce, bow-tie pasta, cherry tomatoes, cucumber, and a delicious Caesar salad dressing. 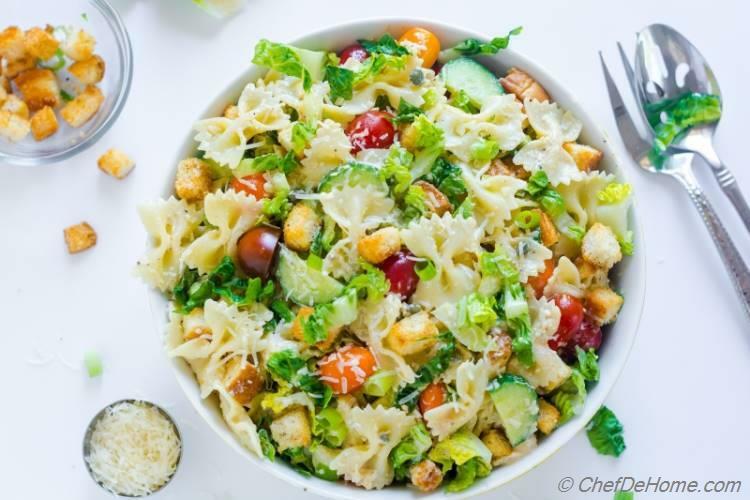 With crunch of croutons and buttery parmesan cheese.. this summer pasta salad is dream-come-true for Caesar salad and summer pasta salad lover! It is one of my favorite potluck Pasta Salad. it takes just 20 minutes start to finish. Plus, I love the fact that I have something which everyone can eat in my summer gatherings. Even anyone with egg/fish allergy will not have to stay away from this Caesar Pasta Salad because I dress it in homemade vegetarian Cesar dressing! Honestly, I love to bring something to potlucks which everyone can enjoy. With lots of my friends shifting to vegetarian diet in summers. So, such all-veggie salads fill the gap. 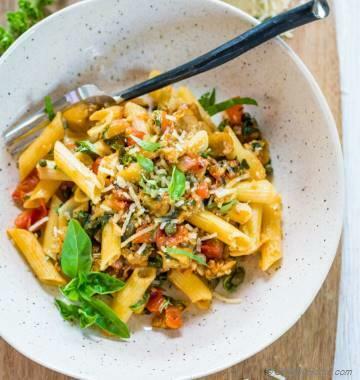 Also, there is only that much cooked on grill at a time.. while burgers are grilling, filling salads such as this pasta salad are something everyone like to snack on. So, what do you say? Let's make summers gathering more exciting one bowl at a time! Let's make some Caesar Pasta Salad! Remember, Vegetarian Caesar Salad dressing recipe that I shared a few weeks ago? This Caesar salad uses that as a base. Since Pasta Salads need more creamy base dressing than leafy salads.. I replaced two things in this recipe for more creamy texture. Don't worry both are vegetarian and don't get watery when on potluck buffet table for long. 1) I replaced butter milk from earlier recipe with thick Greek non-fat yogurt. Greek yogurt is healthier and easy way to brighten up creamy dressings without much fat or eggs. 2) I also added 1/2 of cup of olive oil veganaise (an egg free alternative to regular mayo). You can also use mayo if you prefer. The above two made a creamy dreamy Caesar salad dressing which works perfect in pasta Caesar salad. To make Caesar Pasta Salad, I start by boiling some water to cook pasta. Different pasta cooks in different time. It is always good to read directions on Pasta Package to ensure it is cooked al-dente. For pasta salads, I like to cook pasta al-dente which means it still has some bite. This way it does not get mushy while cooling down or while sitting in the dressing. Note: Pasta or pasta salad, it is important to season cooking water with generous amount of salt. As pasta cooks, it absorbs water and gets seasoned. If water is well seasoned, cooked pasta will taste delicious own it's own in pasta salad or otherwise it will be bland. So, while pasta cooks, I mix a batch of Caesar dressing. Like I said, for today's recipe, I used all plant-based ingredients which makes this pasta salad fully vegetarian. It does not mean that you can't make chicken Caesar pasta salad with it. Just add some grilled chicken/rotisserie chicken. You can also use this easy all-purpose baked chicken recipe. That's it. Once pasta has cooked and cooled, and dressing is ready. I mix pasta into dressing with tomatoes, cucumber, romaine lettuce, green onions, and some more parmesan cheese. If packing for potluck, I don't mix in croutons and leave those for last minute. Even though croutons stay good and soak in some dressing like a Panzanella Bread Salad.. I still prefer add'em at last for that extra crunch. Speaking of crunch, even though this is a pasta salad.. this salad has lots of crunch. Cucumber, croutons, romaine lettuce! Pure yumm! Isn't it great to update classics? Honestly, Caesar Pasta salad is not an upgrade.. 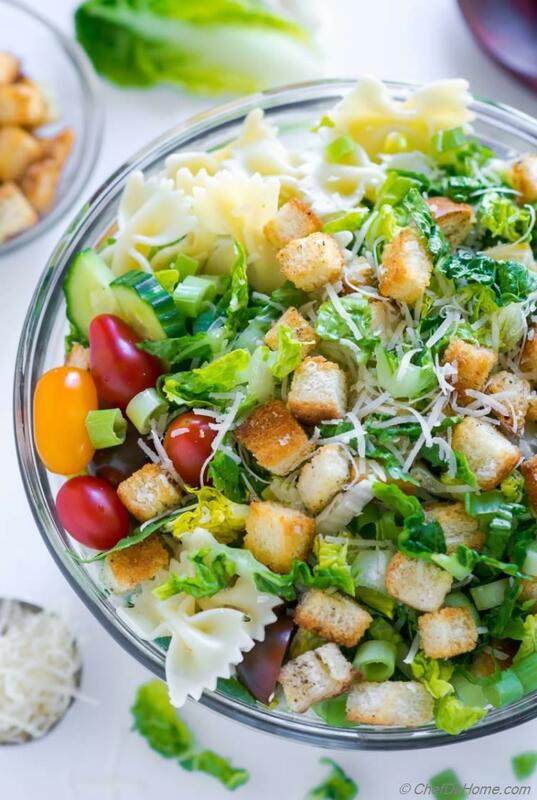 Pasta and Caesar Salad are made for each other. Don't just believe my words. Try it! You will fall in love, how creamy nutty Caesar dressing brings pasta, romaine lettuce and croutons together. I added cherry tomatoes since they are in season and give nice color to pasta salad.. plus cucumber because I love crunch of fresh cucumber in salads. But, you can use many other veggies: celery, carrots, red radish, all will go great. 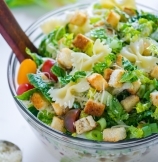 1) A creamy dreamy Caesar Salad - Pasta Salad perfect for summer potlucks or BBQ parties. 2) No eggs, no anchovies yet creamy Caesar dressing taste. You will love this one. I promise! 3) Good news! 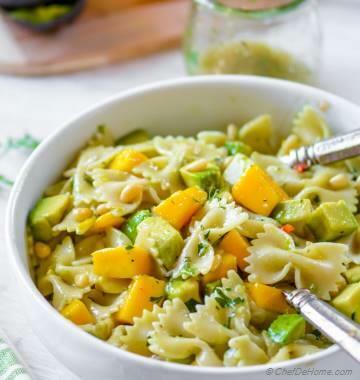 This pasta salad is all vegetarian. Make a big batch because every guest will want it. 4) Last but no way the least, just 20 minutes start to finish. Oh, and dressing can be prepared up-to two days in advance. 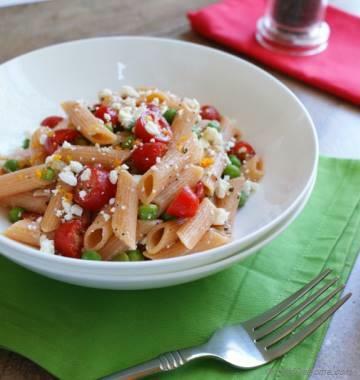 I would love to know, what is you favorite Pasta salad? Leave a comment below and let me know! 4. 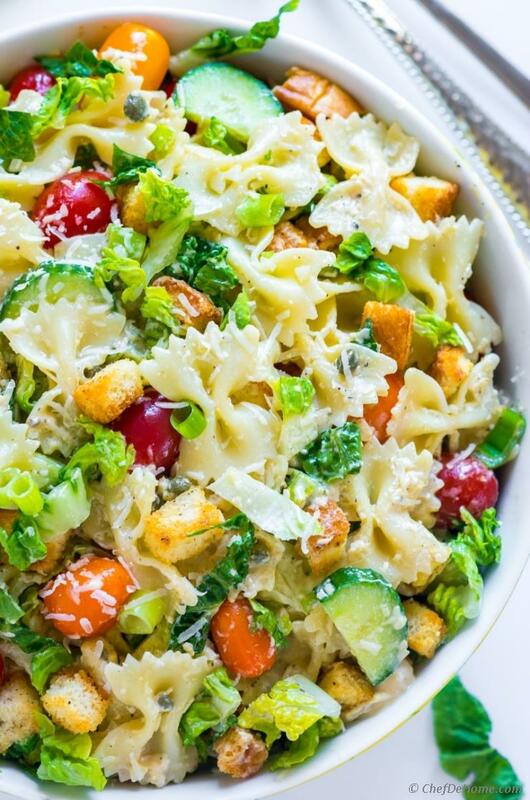 Caesar Pasta Salad. You are already looking at it. :) Isn't it a delicious looking summer salad? I'm loving it! 5. few more coming.. anything you want to see? Drop a line. I will be happy to share. 1. Cook pasta according to package directions. Once pasta has cooked, run it through cold water, drain well, then transfer it to a wide salad bowl, add 2 tsp oil, toss well and set aside to cool completely. 2. To make dressing, in a wide salad bowl, add all dressing ingredients i.e. capers, soy sauce, yogurt, olive oil, vegenaise (or mayo if using), mustard, lemon juice, garlic, and black pepper with 1/3 cup parmesan cheese. Mix well with whisk and set aside. 3. 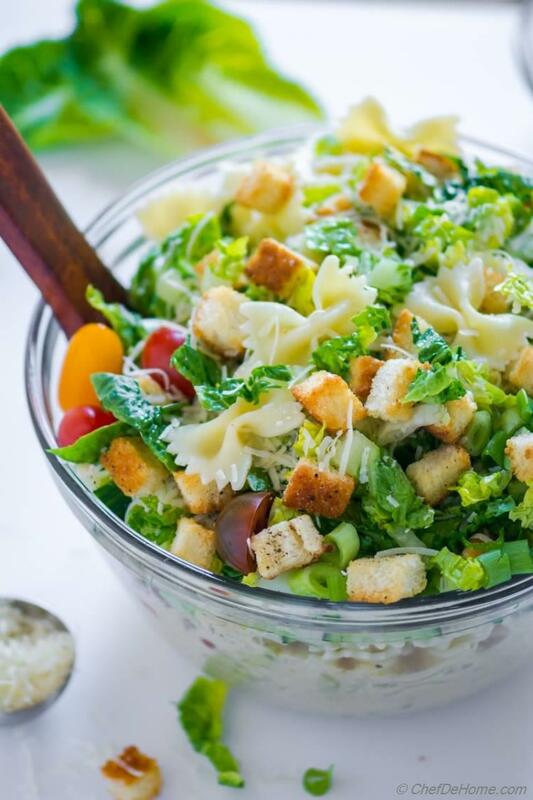 In bowl with dressing, add cooked and cooled pasta, cherry tomatoes, cucumbers, green onion, and romaine lettuce. Toss to coat everything in dressing at the bottom of bowl. Garnish with more parmesan cheese. Serve and enjoy! If making for a potluck or serving later? 1.Don't mix in croutons with salad. Mix those in just before serving. 2. Reserve a few tbsps of dressings while mixing in pasta salad ingredients. Mix it in just before serving. Vegenaise is good replacement if you can't eat eggs. If not, feel free to use regular mayo. This Caesar pasta salad is very good. I cheated and used Lighthouse Caesar dressing since I don't usually use capers on a regular basis. So, I added more parmesan in the salad. I dug into it right away and will definitely make it again.